To stand out from the crowd this holiday season, trust the team at Ignite Christmas Lighting to transform your commercial property into a winter wonderland. 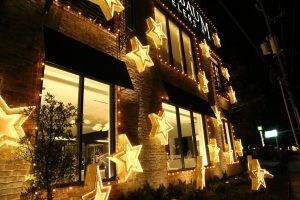 We specialize in exterior lighting for commercial clients throughout Houston, and our custom lighting designs enhance the features of your property and attract customers to your space. Our commercial packages start at $5,000. Our turnkey holiday lighting package includes the design, installation, maintenance, and removal of holiday lights, which means you don’t have to lift a finger. We begin with a meeting to understand your vision for the property, and we create a custom lighting design based on that criteria. Once the design has been approved, our team of holiday lighting experts installs the Christmas lights quickly and efficiently. We offer a full warranty on our lighting throughout the holiday season, which means our team will repair, replace, or troubleshoot any lighting issues at no additional cost. We remove the exterior lighting after January 1st, and we offer complimentary storage of the lighting and décor during the year. For more information on our commercial exterior services, contact a team member at Ignite Christmas Lighting today!